Condi to Iraqis: "Surprise!" 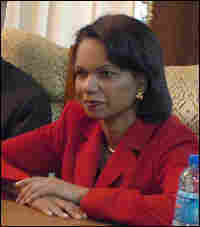 : Blog Of The Nation Secretary of State Condoleezza Rice visits Iraq, unannounced. Earlier today, after a trip to Paris, Secretary of State Condoleezza Rice paid a surprise visit to Iraq, to visit Kirkuk and Baghdad. On Sunday, Turkey attacked Kurdish rebels in northern Iraq. Since then, several news outlets, including NPR, have reported that several-hundred Turkish troops crossed the border into Iraq, to fight PKK guerrillas there. In The Washington Post this morning, Ann Scott Tyson and Robin Wright reported on the United States' involvement in the attacks. Pentagon officials told them that the American intelligence community provided Turkey with real-time intelligence information. We'll talk about Turkey, Rice, and northern Iraq in the second hour of our program. What questions do you have about the region? Or about Secretary Rice's visit?